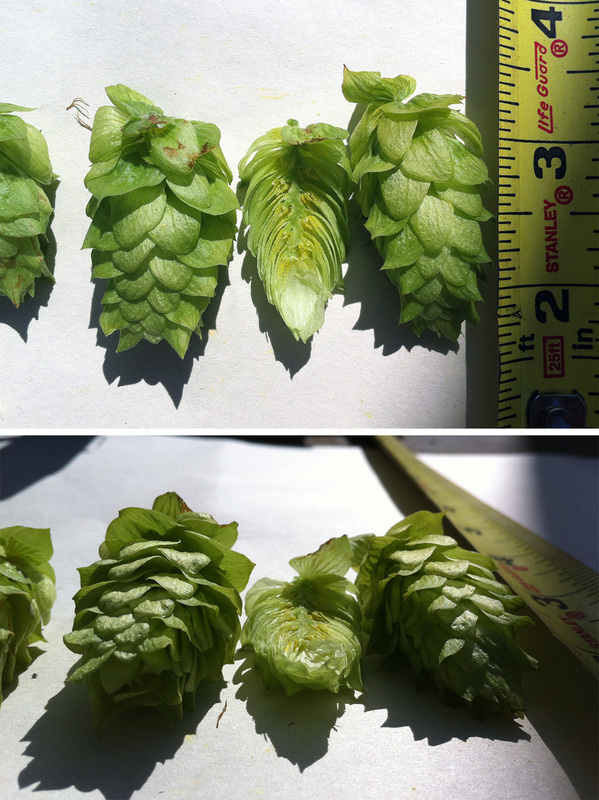 We are starting to catalog the experimental hops growing at the Barber Hop Yard. This page will be updated as data rolls in. There are a total of 42 different crosses – culled down from the germination of over 500 seeds. Some are first-generation crosses in their 3rd year, others are second-generation crosses in their 2nd year. Every plant was dug up and transplanted in the spring in order to help mediate a side-by-side comparison. Very healthy plant with tons of fluffy, torpedo shaped cones. Took over its neighbor 012 a bit. Notes: Torpedo shaped cones. Compare to 2014 cones. Square shaped, 2-tone cones. The large cones were plentiful and had a pleasant scent. Notes: Compare to 2014 cones. Huge plant with red bines and the biggest cones in the yard. Took over neighboring bines. What a beast! Originally, I thought that 018 had 4.5 cones, but it was really just this plant taking over! Huge plant with massive, thick bines. Took over a couple of the other plants. The massive amount of cones picked in 2014 was not a fluke – this thing puts out! Planted late when 023 died. Didn’t really give it a fair shake. 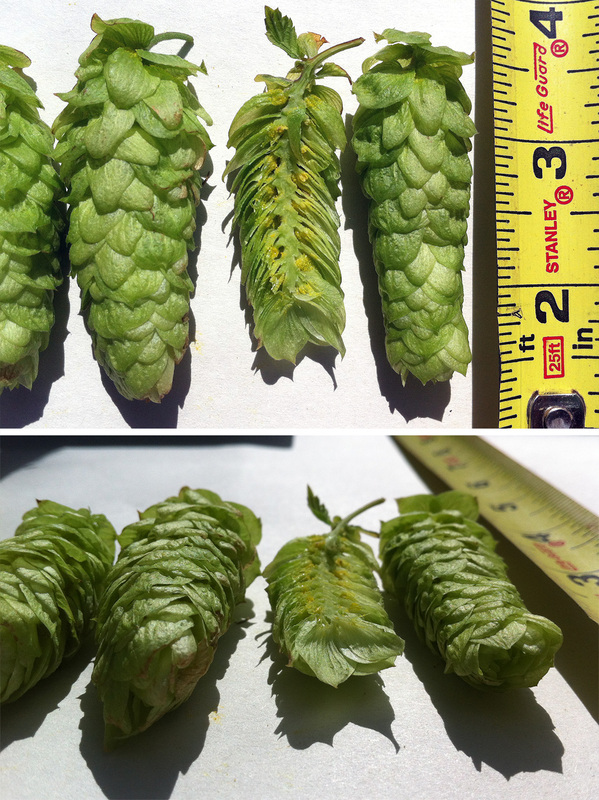 The cones were covered in honey bees – something that I have never seen before on hops. Observed 9/2 and 9/9. Bees were only on this one plant, avoiding all others. There was quite a bit of aphid damage (comparable to the Chinook), however the bees didn’t seem to be going after the aphids/honeydew. They seem to actually be trying to get into the cones. Took a short video. Lots of small dense cones. Smelled wonderful. Exciting plant. 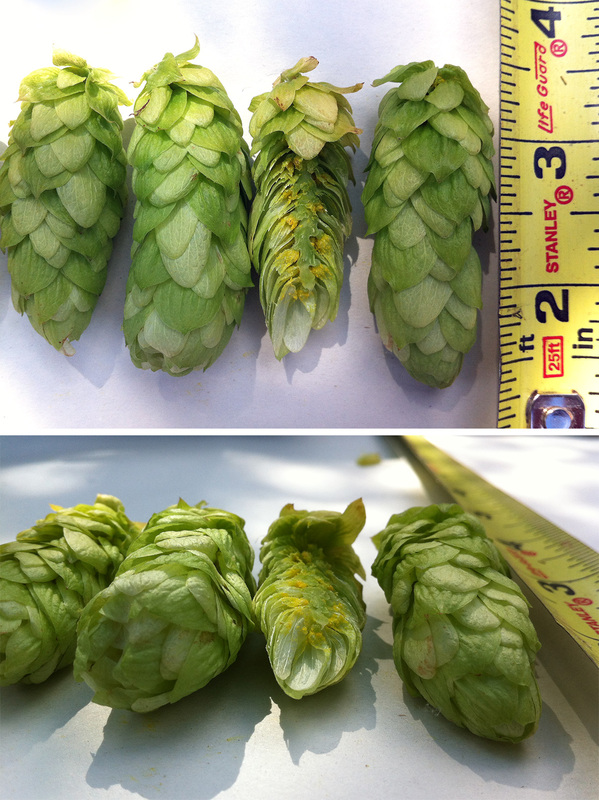 Honey bee continue to stick around the location long after it was cut down, but continued to ignore all the other hops. Medium-size cones. Plant in good shape with no insect damage. Tangled a little with 031 next to it. Medium and large somewhat fluffy cones. There were a few protoflowers. Almost skipped this one, but doesn’t look too bad after all. One or two angel wings. Really healthy overall with very little bug damage. Clusters of raggedy cones that pop off easily sometimes, other times are hard to pull off. Hands felt oily afterwards. Healthy plant no signs of male flowers. No angel wings. Good fade. Nice healthy plant. Lots of big cones. Some sections of brown where bines were damaged from picking the neighbors last week. Very, very small amounts of protoflowers. Only one or two angel wings. Medium cones of consistent size. Plant in really good shape. Almost no fade. Quite a few angel wings. Square profile on ragged, pointed cones. Tight sharp cones. Very healthy plant. A few angel wings. Only a little fade. Long cones with hooked bracts (like chinook). Overall very healthy plant. Beautiful plant with clusters of dense conical cones with small points. Unfortunately, I found a few small sections of protoflowers. Not sure I should be concerned…found a few more developed flowers decided not to pick after all. Culled. Clusters of medium size cones with a round profile and pointed. Most developed in sets of three. Very healthy looking plant. Cones popped off easy. No angel wings. Intermixed a bit with 080. Long cones size medium and smaller. 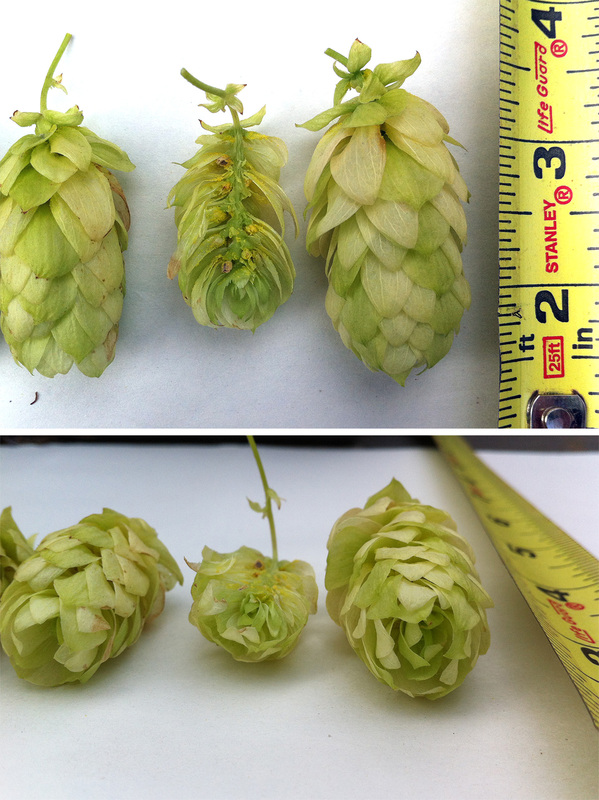 Several cones with angel wings and lots of clusters of deformed, smaller hops. However no signs of male protoflowers at all. Very plentiful, smells good. Healthy plants with tons of small to medium, dense cones. A consistent conical shape. A few angel wings and protoflowers, but nothing fully developed. Only picked a few of the cones the ones that fell off on 9/2. Took a long time to complete the harvest on 9/9. Lots of very dense, very heavy, long cones. Small to medium in size. Only filled half a bag, but it weighs a lot. They feel dry enough to pick and the microscope showed mature glands – so, I think they are just really, really dense. Huge cones. Some brown sections indicate that we may have waited too long to pick. Kadie thinks they have strong a garlic smell. I reluctantly agree… They are a bit overripe. Lots of medium-size cones. An incredibly healthy plant with very few angel wings. Long incredibly compact cones with a square profile and hooks that almost turn up (curls). Huge, solid bines. Smells great. Healthy plant. Lots of medium density cones in various small,medium and large size. Only one or two protoflowers and a few angel wings. Fresh conses smell quite good. Huge square cones leave showing a bit of fade. Very healthy plant overall. A few angel wings. Lots of large, square shaped, uniform cones. Very healthy plant with very minimal bug damage. Easy to pick. Seem to be perfectly ripe. Almost no angel wings. Notes: Beautiful cones, even dried. Big cones, but only a few remained at the end of the season. An early flush may have messed things up. Massive amount of medium-size cones clustered mostly near the tangled top of the plant. Cones feel light and fluffy in the hand. Good-looking two tone color. No angel wings or protoflowers to be seen. Our little mutant with the asymmetrical leaves and small, strange cones. They smell good, but are hard to pick. Notes: The happy mutant. Strange leaves. Stranger hops. Only one ready to pick 8/25. Nice cones, but only a few remained at the end of the season. An early flush may have messed things up. Wow that’s a lot of crosses! Good work! hey man, great stuff you are doing here. I just finished reading all your hop breeding results from the past few years. Incredible, very well documented. 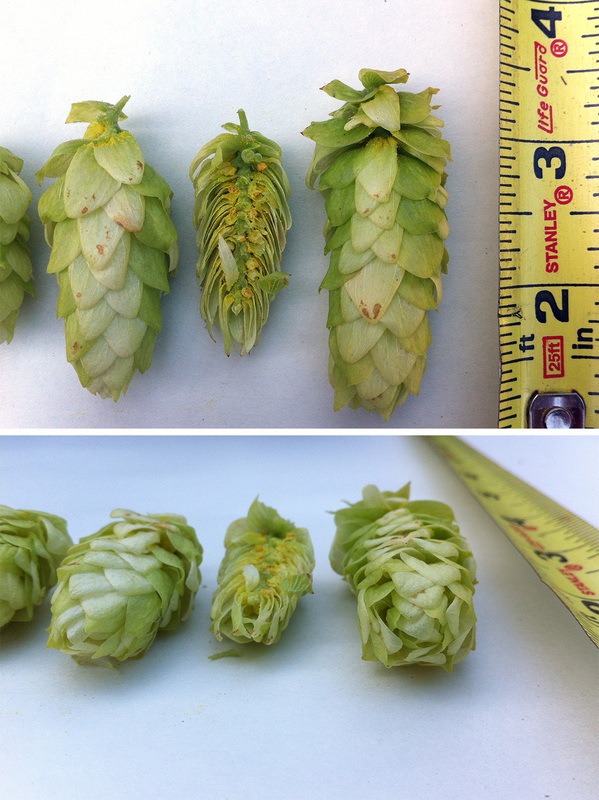 I have a few questions in regards to hop breeding. I’m a newbie and am trying to grow hops in florida with the hopes of breeding something that can withstand the summer humidity and shorter summer days. If you have time I would love to hear your thoughts on how YOU would tackle the endeavor. 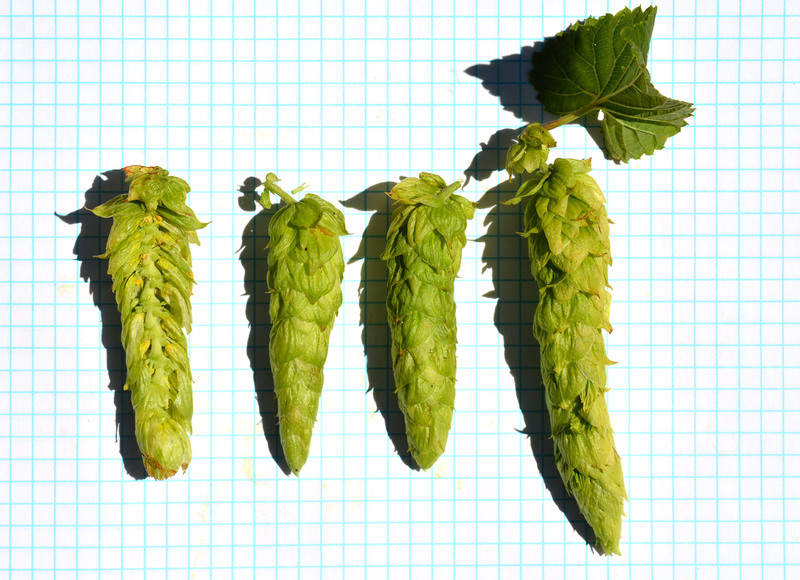 Also, what books or online articles would you recommend to build knowledge on the subject of hop breeding? Thanks! Unfortunately, there is not a lot of literature out there. I do know that there are recent projects to grow hops in Florida and other warm places. Have you had any contact with https://twitter.com/flhops ? One of the issues to tackle may have to do with the length of the day where you are – which peaks around 14hr on the solstice. 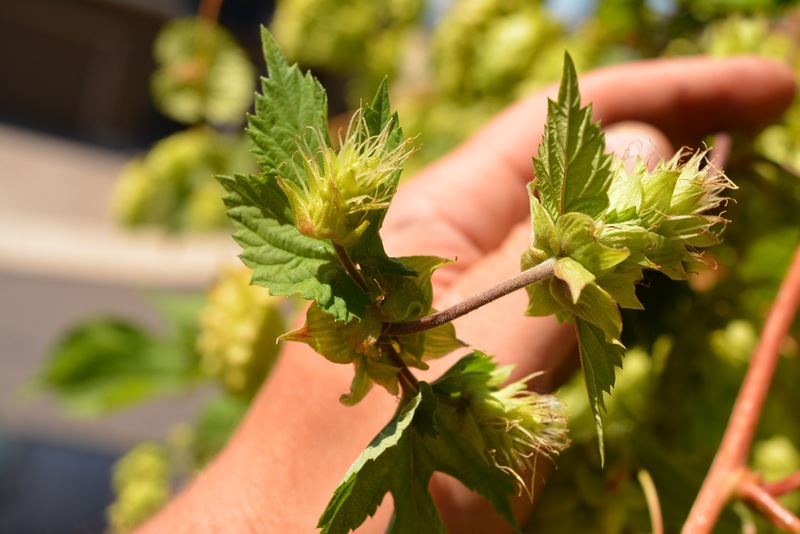 That has been a big problem for developing hops to grow in places like South Africa. Southern Promise, Southern Brewer and Outeniqua have been bred to work in that light limit. I believe that Southern brewer is available from Great Lakes Hops. Might be a promising starting point for you. I am doing some very small scale hobby hop breeding in California, and just made my first crosses. Would you be willing to trade some seeds? I have F1 seeds of neomexicanus variety Amalia x unknown male (to trade). The males female siblings are cascade or Horizon like (reasonable agronomics and mild citrus aroma). Good to hear from you. I’ll take a look, but don’t think that I currently have any seeds available. All of my stock has been sprouted and is growing in the 3 yards. Do you sell? Could I purchase a rhizome of NHB-031 for planting in my apiary? Looks like it could be a wonderful permaculture plant for mite control and possibly do other good things for the bees given how they seem to go after those flowers. Does NHB-031 have any tolerance for dry heat or dryish soil? 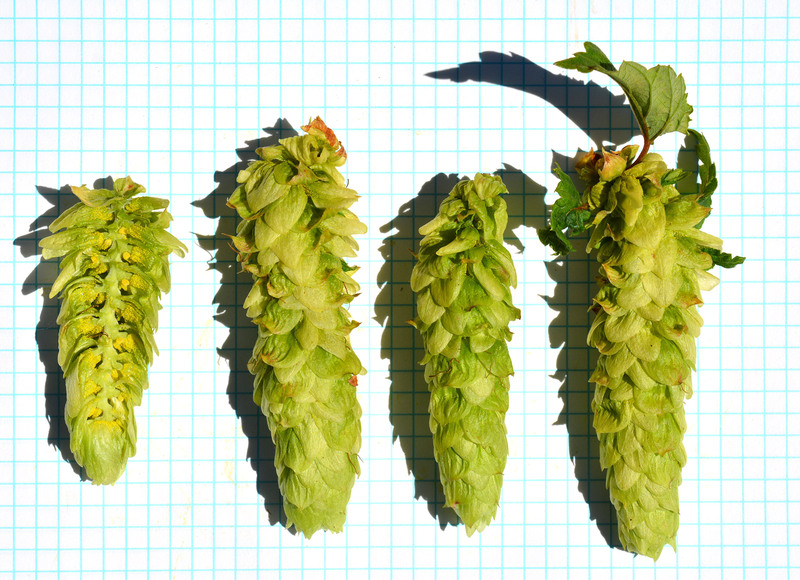 Sorry, but we’re not ready to release any of the hops. Based on our taste tests, NHB031 didn’t actually make the cut. However, I did move it to my own Apiary to see how it works. Hope to have more info soon. OK, thanks for letting me know. I’m actually more interested in the aroma for making hops pillows, and my first priority is to protect the bees. Please keep me informed on their ongoing response. Sounds like you’ve got something special going on, there!